How to Enable PHP Short Open Tag (short_open_tag)? PHP short open tags is a deprecated feature of PHP and it’s been recommended for several years that you not use the short tag “short cut” and instead to use the full <?php and ?> tag combination. But because this short cut has been a feature for such a long time, it’s currently still supported for backwards compatibility. Where is my PHP php.ini Configuration File Located? If you are using PHP-FPM, you must restart that service. Replace php7.2 with your own version, e.g, php5.6, php7.1, etc. Edit the PHP config. Replace php7.2 with your own version, e.g, php5.6, php7.1, etc. Restart PHP-FPM. Replace php7.2 with your own version, e.g, php5.6, php7.1, etc. With the wide spread use of XML and use of these tags by other languages, the server can become easily confused and end up parsing the wrong code in the wrong context. The short_open_tag setting tells PHP whether the short form (<? ?>) of PHP’s open tag should be allowed. If you want to use PHP in combination with XML, you can disable this option in order to use <?xml ?> inline. Otherwise, you can print it with PHP, for example: <?php echo '<?xml version="1.0"?>'; ?>. 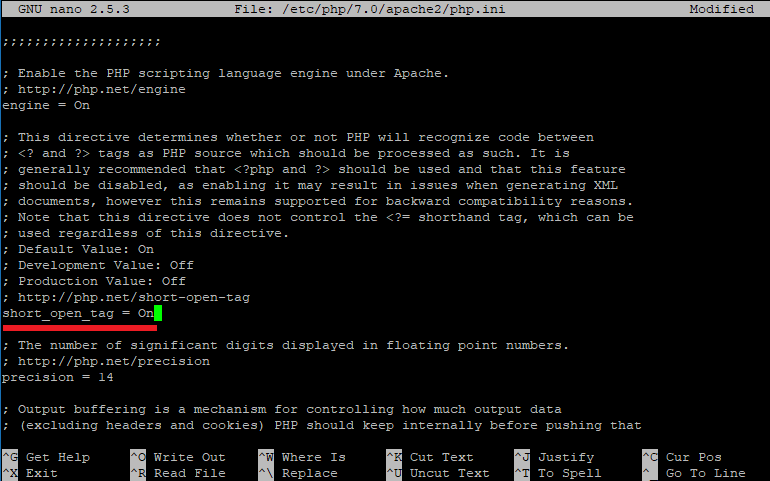 Also, if disabled, you must use the long form of the PHP open tag (<?php ?>). Let me know in the comments if this helped. Follow me on Twitter, Facebook and YouTube. p.s. I increased my AdSense revenue by 68% using AI 🤖. Read my Ezoic review to find out how. We use Markdown to style comments, like on Github and Reddit. To do a line break, type two spaces after the sentence. and it will appear in a block like this.